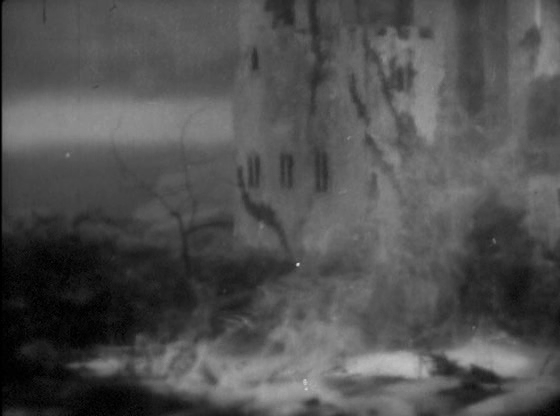 Jean Epstein’s 1928 silent film “The Fall of the House of Usher” is a dreamy, evocative interpretation of Edgar Allan Poe’s short story. It incorporates themes from other Poe stories, and diverges somewhat from the original at the end, yet succeeds in delivering a hypnotic sense of morbid helplessness and fatalism. The movie adheres to the basic story of a traveler (given a name, Allan, in this version) who is summoned to the home of his childhood friend Roderick Usher by a letter which speaks of a mortal illness. However, it does incorporate some changes. 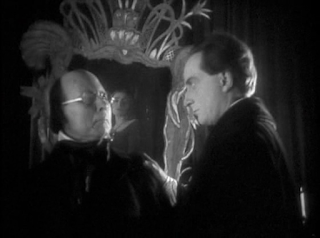 In this version, Madeline Usher is Roderick’s wife, not his twin sister, and although she is mysteriously ill, the movie abandons altogether the theme of catalepsy. Madeline’s physician plays a larger role in the story; he is a sinister figure who seems designed to be a counterweight to Roderick. Whereas Roderick is hypersensitive and artistic, the Physician is impervious and almost mechanical in his movements. Woven into this Poe story is another: “The Oval Portrait”. Roderick is obsessed with painting his wife’s portrait, and as he paints, he seems to transfer her life force from her body to the canvas. Although he loves her, he quickly forgets her in the presence of his art, and when she finally collapses during a painting session, he does not even notice. “This is indeed Life itself!” he declares as he stares raptly at the portrait. It is left to Allan to discover her body, whereupon Roderick has a mental breakdown. Madeline is placed in her coffin, but the grieving Roderick flies into a rage when the doctor and his assistant try to nail down the coffin lid. Then follows one of the most beautiful scenes in the movie, as the four men carry the coffin across the countryside and over a river to place it into a surreal underground crypt. The long end of Madeline’s winding sheet trails behind them like a wedding veil, and as they walk, their path is lined by phantom double-exposure tapers. The beat of their feet on the ground, the shakiness of the camera work, sweeping up into the bare tree branches then down to Roderick’s stricken face, produce the effect of a nightmare from which the dreamer struggles to awaken. At the crypt, the doctor stealthily nails down the coffin lid without Roderick’s knowledge, then the party of men returns to the house. Over the following days, Roderick’s nervous tension increases, until one night a storm brings about a crisis. As Allan tries to calm him by reading him a story, Roderick rocks in his chair with an enigmatic smile on his face. 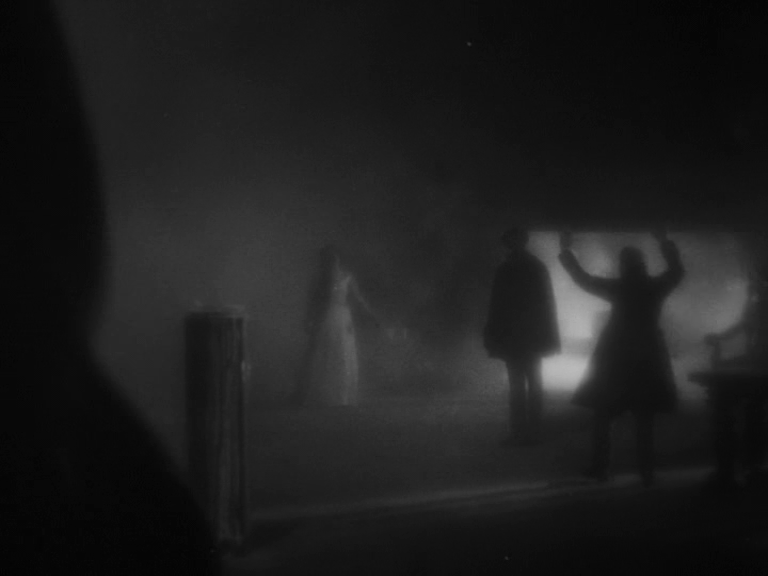 Meanwhile, in the crypt, the coffin falls to the ground, and then we see the figure swathed in white gauze emerging and approaching the house. Roderick continues to rock more wildly, and the huge fireplace, blazing with fire, fills the hall with billowing clouds of smoke. Throughout the house, the relentless wind sets the curtains undulating and surging as books and furnishings start to fall. 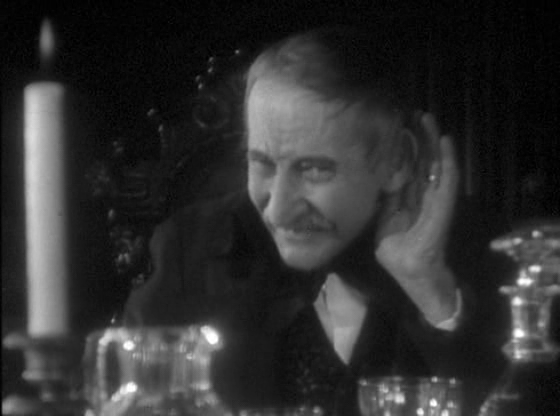 The house itself is literally sliding downwards when Roderick reveals the appalling secret: that Madeline had been buried alive. At this moment, she appears at the door, and the room begins to catch fire as she falls into Roderick’s arms. In a departure from the original story, the 3 main characters manage to escape as the house collapses and the movie comes to an end. 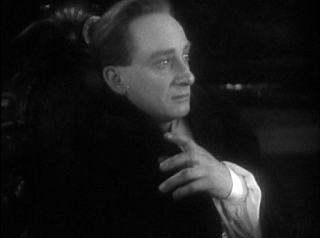 Charles Lamy, playing Allan, seems miscast for this role. He appears far too old to be the boyhood friend of Roderick Usher, and looks more like a crusty old lawyer coming to read a will than a devoted friend responding to a plea for help. The impression of age is reinforced as Allan needs a magnifying glass to read and uses an ear trumpet, though the props seem intended to furnish an explanation to the character himself of why he cannot hear the sounds that the hypersensitive Roderick perceives. 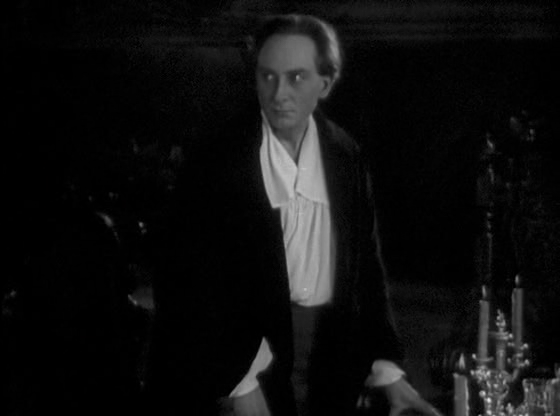 If Charles Lamy was an odd choice to play Allan, Jean Debucourt is cast to perfection as Roderick. His pale, sensitive face, with its large, liquid eyes and soft hair is far closer to Poe’s description than Vincent Price’s more sensual features in Roger Corman’s 1960 version of the story. Marguerite Gance, the wife of director Abel Gance, plays Madeline with a somewhat monotonous air of long-necked pathos. She does little more than look pained and long-suffering until her death scene, which is only made memorable by the imaginative camera work. The house itself is a character in this story. The first view of the exterior is interesting, as the film makes no attempt to present it realistically. An obvious model of some sort of castle-like structure is dimly seen across a misty, desolate landscape. This should not be dismissed as reflecting the limitations of the filmmaking of the time; Epstein could easily have shown us a genuine mansion, or even a model of a real house if he’d wanted to. This is an artistic decision, to underline that once Allan crosses a boundary to approach the house – like Jonathon Harker crossing the bridge in ‘Nosferatu’ – he leaves the world of the mundane and enters an uncanny realm. 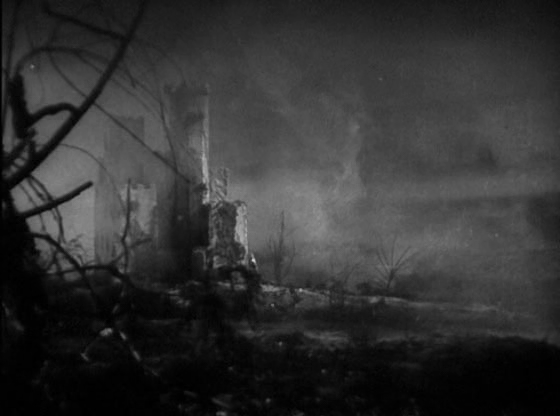 The final scene of the house sinking into ruin is pure surrealism. 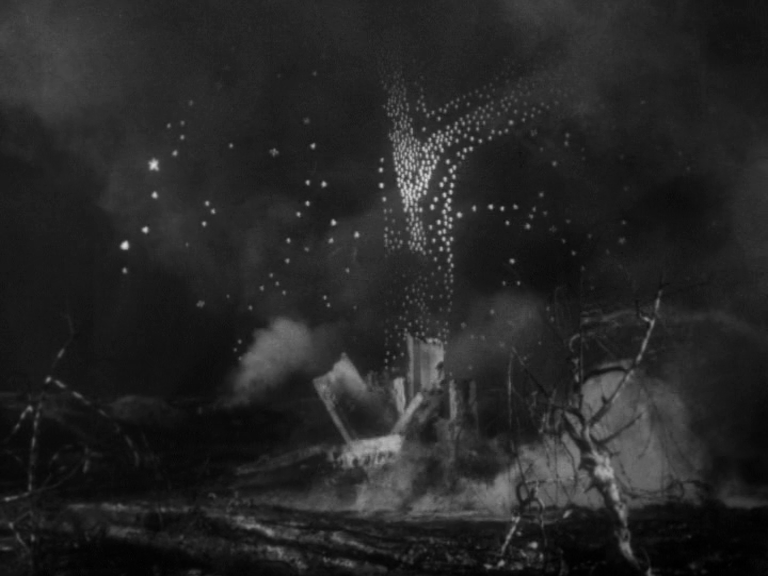 A torrent of stars seems to pour down from heaven onto the collapsing house as the survivors stagger through the flames and smoke into the woods beyond the blasted environs. 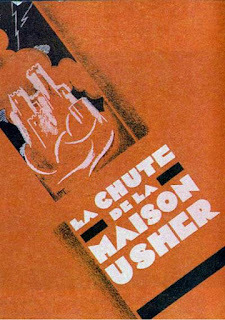 There are several versions of “La Chute de la maison Usher” available on YouTube, with different accompanying scores. I prefer the score by Roland de Candé, which has themes reminiscent of early music, played on guitar and lute. This version also takes the unusual step of omitting English subtitles on the French intertitles, and instead has the English translation read aloud by the actor Jean-Pierre Aumont.